I have Technology-Rich Classroom – Now What? Simple, clear procedures have always worked for me for any kind of classroom management. Whether it be a technology-rich classroom filled with laptops (or whatever other devices you may have) or a classroom with hardly any technology. A classroom with access to many devices might feel overwhelming especially when that kind of environment is new for you. Below I share five simple tips that have worked for me over the years. However, it’s like anything. These take time. They need to be modelled and revisited during the year to ensure the smooth operation of learning continues in the classroom whether the devices are in use or not! Our Classroom Expectations that we make together at the start of the year and agree to as a class, work just as well online as offline. We’re respectful. We listen and take turns. We try new things and we have fun and so on. The expectation is that these apply even when we use technology (it’s just another tool right?) There’s some slight tweaks on those expectations that are needed every now and again. For example, when I need everyone’s full attention. Lids are at 45 if we’re on the laptops. When we take turns sharing a laptop or ipad, one person is the “driver” (the driving the mouse/trackpad or touching the screen) and the other is the “navigator” (keeping an eye on the time, managing what needs to be done next). Then we swap because we share and take turns. In a high school class I watched a colleague use the “phone stack” expectation. She wanted her students to be able to use smart phones in class. Her expectation was that when they weren’t needed, they were stacked at the edge of the grouped tables, face-down. In addition to that expectation, she had 2 minute “tech-breaks” on the hour in place. Not a break from tech, but “a break to check your tech”. Her students knew that they’d get a chance to check their phones and/or social media etc. This had a huge impact on her students. They stayed focused and on task simply because they knew they would get the chance to “look at their phones” without having to take sneak peaks! In addition to establishing expectations, you may also want to ensure that you lay out consequences for violating any expectations. This can be loss of technology privilege, a note home, confiscation of the device, or a meeting with the principal. Or it can be whatever else you decide is necessary in order to ensure that everyone understands what is expected of them and the natural consequences of not complying with them. Do consider designing those consequences together with your students. It’s much more powerful. Students are more likely to avoid the consequences when they’ve been a part of deciding what those consequences are! Plus I find they are usually way more harsher than me so we are able to find a happy medium! We all know that our lessons should be engaging and need to have students to staying on task at a steady pace in order to complete them. Helping students to stay engaged can include playing to their passions, setting firm due dates for a task, differentiating and/or scaling the task for students who finish slower and/or faster. I know that my students become bored when the tasks aren’t authentic, meaningful, engaging or challenging. 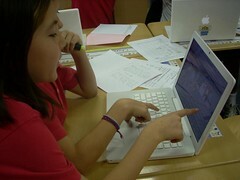 Differentiation, motivation and engagement are all made easier thanks to the technology devices we have access to. I like using the Socrative app with my students to help keep them focused on a particular task. At the same time it provides me with meaningful assessment that helps guide me in moving their learning forward. Exit-tickets (something they must complete before leaving) is a great way to do this. You don’t have to use Socrative. You could use Google Forms or ThatQuiz (math). When I’m looking at various tech tools to use in the classroom, one of my criteria for evaluation of that tool is whether it has the ability to differentiate. (See Right Tool for the Task below). Even 6th graders (or older) can benefit from this! Whenever a new tool, app, piece of software, or device is introduced we have a “sandpit” time. I let kids have a play, figure out what it does and do the silly stuff with it. I do have a time limit (adjustable for various age levels and based on “knowing” your class). Another tip is to explicitly state when the “Silly First” time is over. When we first started using the commenting feature of google docs, I gave my students 3 minutes to say hello and type random letters (which 3rd graders have a tendency to do). If we are learning to use a new app on the iPad like DoodleCast Pro (a fav of mine!) or Educreations Interactive Whiteboard App I will actively encourage my students to make one silly recording before they delve into the task. I believe this helps “get the silly-ness out” and creates a fun learning time. It doesn’t always stop it from occurring – but that’s usually a deeper issue! Most of the problems of using new technology arise from the novelty or newness of the device and/or app/program. If we let students get past the initial excitement they are more likely to be focused on the “serious” learning task. Something I’m always asked about is what I do about the inappropriate use of technology (phones, tablets, and/or laptops) in my classroom. Go walk-about is an aboriginal term meaning “highly mobile” and it immediately spring to mind when I’m asked about this topic. Sometimes people don’t like what I reply. In my own personal experience, the best way to ensure that students stay on task is to walk around the room. Look at the work they are doing. Discuss and engage with them about their progress. The more active and mobile you are in the classroom, the easier it is to ensure that your students are on working on what they should be. If you notice that children are quickly closing browsers windows when you come near or “double tapping” the home button on their iPad (that’s a clear sign that they’re switching apps) then you need take some time to investigate what the student is doing and have a discussion with them if necessary. (Refer to Expectations at the top.) I wrote How Do You Manage IT? a few years ago. If you’ve got time, you might like to check out my 10 top tips for managing technology in your classroom. The trick is to never let technology erode the relationships in your classroom. What are your go-to strategies for managing a classroom with many devices? Favourite tips? I’d love to hear from you! Image Attribution: I tried really hard to find out who owns this image so if anyone knows can you please let me know so I can give them credit! Essential Question: What are ways you manage the use of laptops in your classroom and what additional best practice ways might you add? Simple, clear procedures have always worked for me for any kind of classroom management whether it be with laptops or without. Here’s just a few tips and tricks I use when working with laptops in the classroom. 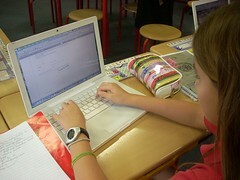 All procedures are modeled and revisited during the year to ensure the smooth operation of technology in the class. Tip #1: Have students lower laptop lids 45° when giving important instructions. You would do this any other time – working with laptops is no different. Rove around the classroom while students are working. You do this any other time too – again, working with laptops is no different. Tip #3: Make an Experts Chart. Train 2-3 students to be the experts in something (embeding an image, working in iMovie, blogs, voicethread, garageband, importing audio/video/photos) That way the teacher doesn’t have to be the expert and students get a buzz out of being considered the expert. Tip #7: Ask students at the start of the year to bring in a set of earbuds. (Very cheap here in Thailand). That way everyone has their own headphones. We store the headphones in mini ziplock bags with student’s names on the bags. Tip #8: The flash-drive is an important tool. It’s just like your pencil, ruler and eraser. It’s a MUST have item everyday. Tip #9: Don’t be afraid to say you don’t know how to do something. Students love it when they figure it out before you do. That being said ….. if you’re going to use a digital tool for a project in your class – make sure you’ve had a go at the task first. You do need to know the basics. If you’re not sure how to use a tool, utilize your tech team (if you’re lucky enough to have one) or ask your PLN for help. Tip #10: Keep calm when things don’t work so well. The internet will go down, the programme will not respond but don’t sweat it. Model patience to your students. If you get flustered or frustrated when things don’t work, so will they. More links provided by our CoETaIL course advisors for managing laptops/computers in the class: 23 Things about Classroom Laptops. So what have I missed? What do you do?